Heather R. Mizeur, a Democrat, was elected to the Maryland House of Delegates from Montgomery County in 2006 and began serving in January 2007. Prior to that time she served one term on the Takoma Park City Council. She announced her candidacy for the Democratic nomination for Governor in July 2013. If elected Mizeur would have become the first openly gay Governor in the country. A progressive, Mizeur's campaign focused upon environmental protection, immigrant rights, women's rights, education, and LGBT rights. Her running mate was Delman Coates, who has served as the Senior Pastor of Mt. Ennon Baptist Church in Clinton, Maryland since 2004. In addition to her policies previously noted, Mizeur also opposes "fracking" in Maryland and supports a "Death with Dignity" policy that would allow terminally ill mentally competent adults choose to end their life. The Mizeur/Coates button shown here was secured and provided to us for exhibit by Hagerstown Mayor David S. Gysberts at the Western Maryland Democratic Summit on April 26, 2014. Mizeur lost to Lieutenant Governor Anthony Brown in the June 24, 2014 primary. Brown now goes on to face the Republican primary winner, Larry Hogan, in the November 4, 2014 General Election. Cindy Walsh, a Democrat, was a progressive running as a candidate of "Citizens' Oversight Maryland." She believes that the Democratic Party is lead by neo-liberals who put corporate wealth and profit before the public interest. Healthcare for all, progressive tax reform and strong labor support were among her primary concerns. Walsh received a little over 6,500 votes, or about 1.4% of those cast in her primary loss to Anthony Brown. Ralph Jaffe, a Democrat, promised to "get rid of money in politics" and said he would oppose any attempts to increase taxes. He further declared that he would stay away from paid lobbyists, serve without pay, serve only one term, and always tell the truth. Jaffe received a little over 3,000 votes, or about 0.7% of the total votes cast in the June 2014 Primary in his loss to Anthony Brown. Doug Gansler served as Montgomery County States Attorney from 1999 to 2007. He was elected to the office of Attorney General for the State of Maryland in 2006 and began serving in that capacity in January 2007. Gansler was one of six candidates running for Governor in the 2014 Democratic primary. With "Fighting for You" as the campaign slogan, Gansler's running-mate for Lieutenant Governor was Jolene Ivey of Prince Georges County, who was elected to the Maryland House of Delegates in 2006 and began her service in 2007. Gansler finished second to Anthony Brown in the June 2014 primary. Charles Lollar, a Republican, is a businessman and former Marine Corps Officer. He was the 2010 Republican nominee for Maryland’s Fifth Congressional District. He lost to the Democratic incumbent, Steny Hoyer, in the general election. 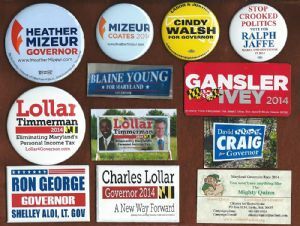 Lollar is a Tea Party Republican and served as Chair of the Charles County Republican Central Committee. In September 2013 he announced his candidacy for the Republican nomination for Governor of Maryland in 2014. Lollar’s campaign slogan, “A New Way Forward,” characterized his belief that cutting excessive taxes and regulations is the way to creating job growth and economic opportunity. He was one of four Republicans vying for the Republican nomination in the June 2014 primary, which was won by Larry Hogan. Hogan now goes on to face the Democratic primary winner, Anthony Brown, in the November 4, 2014 General Election. David Craig was one of four candidates running for the Republican nomination in the June 2014 Primary. Craig was appointed to the position of Harford County Executive in 2005, and was elected to that position in 2006, and re-elected to that office in 2010. Prior to that time he served as Mayor of Havre de Grace (1985, 1987, 2001 and 2005), in the Maryland House of Delegates (1990-1994), and in the Maryland State Senate from 1995 to 1999. If elected, Craig promised good paying jobs, a cut in taxes, a balanced and responsible budget and the protection of our 2nd. Amendment right. Craig finished second to Larry Hogan in the June 2014 Republican primary. Ronald George was elected to the Maryland House of Delegates in 2006, and has served in that legislative body representing Anne Arundel County since 2007. A businessman, George was one of four candidates running for the Republican Gubernatorial nomination in the June 2014 Primary, which was eventually won by Larry Hogan. If elected George promised to undertake independent audits of all state agencies, lower corporate taxes and build up the Baltimore City tax base. George's running-mate for Lieutenant Governor was Shelley Aloi, who served as a Frederick City Alderman from 2009 to 2013. Blaine Young served as a Frederick City Alderman from 1998 to 2002. At that time he was a Democrat. Upon leaving office he joined the Republican Party as it more mirrored his beliefs in lower taxes and limited government. In 2010 he was appointed to a vacant seat on the Board of Frederick County Commissioners, and in 2010 was elected to a full-term. He is currently (2014) running for Frederick County Executive. Young flirted with, but later decided against the idea of running for Governor in 2014. The image shown here, taken in March 2013 at State House Circle in Annapolis, appeared on his campaign motor-coach. His campaign slogan had been, "The People's Veto." Shawn Quinn is the Libertarian candidate for Governor of Maryland. Term limits, tax reduction and a reduction in the size and abuse of government are among his major concerns. He further believes that government should not interfere with any adult who may wish to marry another adult. "You won't see anything like the Mighty Quinn," from a song written by Bob Dylan in 1968, is his campaign slogan. Shawn Quinn and his running-mate for Lieutenant Governor, Lorenzo Gaztanaga, received 25,382 votes, or 1.5%, in the November 4, 2014 General Election which was won by Lawrence J. Hogan.